This textbook provides the first holistic resource on Environmental, Social, and Governance (ESG) investing for undergraduate and graduate programs. It provides a thorough background and history of ESG investing, as well as cutting-edge industry developments, in a way that introduces the reader to the rapidly developing field of responsible investing. Beginning with a comprehensive background of ESG investing and the development of models measuring risk and return, the book then discusses the development of ESG risks, and provides an overview of ESG rating systems. The textbook also outlines the current position of ESG investing in portfolio management through granular analysis, provides insight into common investor concerns about ESG investments, discloses qualitative theories relevant to ESG investing, and reviews literature attempting to model ESG investment performance. Finally, the authors provide readers with a foundation on the development of financial models measuring risk and return, which will be useful for measuring the performance of ESG investments. With case studies from contributors around the world, this textbook is the first of its kind to truly provide a compelling blend of quantitative and qualitative analysis supporting the incorporation of ESG investment strategies into investment portfolios. 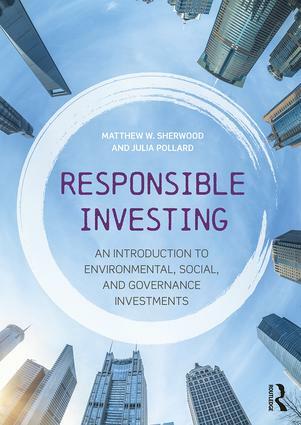 Offering an excellent overview of the growing trends in ESG investing, as well as a close analysis of ESG theories and their practical application both today and in the future, this book will be a great resource for both undergraduates and graduate students.